Stability Test: The thermal stability is described by the loss rate of the target protein. The loss rate was determined by accelerated thermal degradation test, that is, incubate the protein at 37 degree C for 48h, and no obvious degradation and precipitation were observed. (Referring from China Biological Products Standard, which was calculated by the Arrhenius equation.) 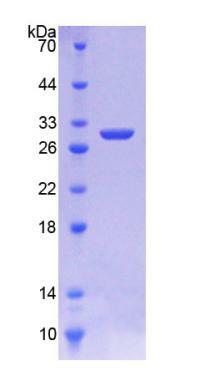 The loss of this protein is lessthan 5% within the expiration date under appropriate storage condition.